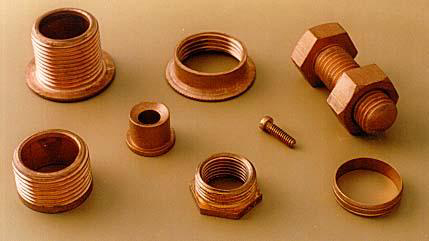 We offer Copper Fittings Copper parts Copper Components up to 40 kg's in weight and up to 1meter in length. Our sand casting facility is well equipped to tackle any challenging Copper fittings Copper components Copper parts Casting job or Copper Parts Copper fittings Copper Components enquiry. Any kind of special die casting sand gravity die lost wax shell molding castings and cast parts casting produced to user specifications. We can be more competitive than Chinese castings and cast parts made in China Taiwan Asia Korea as traditional Indian expertise in Copper castings and Copper casting is superior and Indian Brass Gunmetal Bronze foundry / foundries are more competitive than other Copper/Brass foundries.